What an amazing picture. If you read the comments on that photo you’ll see so many people are blown away by this once-in-a-lifetime capture. There’s no question it’s an amazing image, but it didn’t happen once-in-anyone’s-lifetime. It’s a fake. It is a real image, of course, but if you’re like most everyone looking at it, you’re likely to think the photographer actually pushed the button on his camera and snapped this image. Unfortunately, that’s pretty much physically impossible for a Minolta Dimage to take such a shot, and it’s impossible for any camera currently on the market to have this peculiar range of depth of field. The leaves are out of focus, and the moon is only mildly sharp, but that bat, he’s almost sharp as a tack. Who cares that it’s not really the result of a serendipitous opening of a shutter? It’s a fantastic montage and the whole bat-flying-in-front-of-the-full-moon is a classic motif. The problem I have is that the creator won’t admit that it is a montage. True, he’s under no much obligation to explain how he created his art, but the fact is, the majority of those dozens and dozens of comments address just how amazing this capture is. He thanks them for their encouragement, but he won’t be honest with them about what’s really going on here. When I contacted this photographer she promptly admitted that her photo was made with a Photoshop plug-in filter and it’s even listed in the tags. (I recognized the filter) She’s still receiving plenty of misplaced comments, but by not hiding behind some obfuscating philosophy, we can appreciate her photo for the quality image it is without feeling like we’re being cheated. There are revolutionary differences between digital and analog photography as our traditional family album is different with virtual amazing word of Flickr, and obviously that is way we are here. In analog photography after releasing the shutter we are almost disable to change or edit the images but in digital photography we are privilege to work with the pixels and using the tolls to Modify, edit and in fact to create new generation of artwork and photography that it was impossible with analog photography. So if you even think that it is an adapted Image please do not call it fake because it is not. - [a commenter] said : “I just don’t understand why you didn’t clarify that this is not a real picture”, But as far as I know a photograph simply is visual face of data, cached from reality and saved on the memory and no photograph whether analog or digital can be real by itself (except in material of physical memory ). And in the other hand as a creator and owner of this picture I think that I have a little right to tell or not about the details and technical information of it, so would you please accept it as it is ? So, I guess he’s admitting that it’s edited. Sort of. Kind of. Maybe. We all edit our pictures. We crop and sharpen and boost color. Digital cameras do those things even before we download the picture to our computers. We might use a polarizer or a filter. We might turn a color image black and white or turn our demon friends in to mere mortals by removing red-eye. All of this is still a far cry from putting our girlfriend’s face on Pamela Anderson’s body. Well, since he asks, I accept the picture and so do those kind souls who pointed out what it really is. They just want to let people know how it was likely made so that the poor folks who are misled into thinking this really is something that, with enough patience and a tripod, they too could capture with their point-and-shoot cameras (or any camera for that matter.) Like many, I waste so much time on flickr looking at photos to learn technique and to be inspired. When I see a shot that’s so much better than anything I’ve made before I start to wonder what they did and how could I learn how to do it too. I don’t think I am alone in this and that’s one of the problems here. When I asked the creator about it others followed up by saying it “just doesn’t matter.” And maybe that’s true. Maybe those folks who thought this really was an amazing capture are just naive. I still wonder why, in the face of a direct question, the artist refuses to stand up and be proud of the work he did do. I think it is simply disingenuous. What do you think of the flickr cheaters? If they won’t do it, we will. Governor of California, Arnold Schwarzenegger announced that he was joining he governors of Oregon, Washington, Arizona and New Mexico in broad agreement to set pollution reduction targets within six months and design a market-based program. These Western states don’t feel like they can wait on federal regulations to reduce CO2, so they’ve decided to do something about it. Utilities in Oregon spoke up that they appreciate this regional approach, but they’d prefer a national plan. They’re right to want one because it would make significant gains efficiency and effectiveness of a cap and trade system where one polluter can buy rights to pollute from a cleaner competitor. Just the same, I am happy that the states are taking the lead in matters like this. It’s a victory for states rights and it recognizes the plain fact that California and it’s neighbors are an economy that ranks in the top ten with full-fledged countries. Furthermore, it sends an extremely strong message to the national government that this is something that the people find necessary and tractable. And that’s the way it should be. We’ve grown too accustomed to the national government sending down edicts of how this or that should be regulated and waiting and hoping on them to act the way we want. The western states recognized that the Washington wasn’t going to act so they took matters into their own hands and got something done! They realized that if you want something done, it’s a good idea to start with yourself. Utilities can complain that this isn’t the most efficient way to do things, but at least something is getting done! Hijab means to veal, conceal or cover and it essentially refers to the head covering that Muslim women wear. Typically, the simple head and neck covering scarf is known as hijab while the face cover is part of a niqab and cloaks and other forms of dress such as the burqa are local variations in the muslim world of feminine Muslim dress. The Qur’an and the Hadith (the oral traditions of Mohammad) give more details of women’s and men’s dress for Muslims. First, women should not appear as men. Second, Muslims should distinguish themselves from unbelievers and third, clothing should be modest and not gain others attention. The first point was clear from virtually all women in Egypt. The primary difference between scarf wearing westerners and Egyptian women was how feminine the Egyptians looked regardless of their clothes. My modestly dressed traveling partner was very obviously western to the locals. While her head was always covered, she wore hiking clothes and a modest loose fitting shirt. She fit the modesty requirement well, but her clothes told everyone she was no Muslim and perhaps worse, she wasn’t dressed much differently than I, a man! Just the same, Egyptians seem to appreciate her modesty and she enjoyed keeping Egyptian dust and pollution out of her hair. Overwhelmingly, Egyptian women don’t meet the requirements either! Sure, a good 80 – 90% did, indeed, wear the hijab, but the vast majority of them wore the headscarf over tight-fitting western clothes. Many of the fashions were obviously modified by the requirements of modesty, but form fitting clothes were more the rule than the exception from Cairo to Aswan. Maybe 10% of women wore a burqa and/or niqab (the complete face covering) but one Cairene woman that we met claimed that most of these people were probably from Saudi Arabia. While she very much enjoyed donning the traditional clothing during her recent hajj (her pilgrimage to Mecca) she claimed she’d never wear such things during her regular job as a dentist at home. It is difficult not to see the hijab and niqab as a little bit oppressive to women, even though those wearing them won’t tell you that they are. While women must hide their beautiful hair from men and each other, they still try to look beautiful, often with decorated head scarfs (technically, that’s against the hadith teachings), and quite a bit of makeup. There’s no question that seeing the world through a veil restricts women’s view, even if it may offer valued security. Furthermore, men seem to be under no such requirement. Certainly some men, perhaps as much as a quarter of them, wore traditional gallibaya, a long robe and small skull-cap, but those clothes are much less restrictive. The rest of the men, young and old would be at home in most of Europe complete with torn jeans. Perhaps the veil offers Middle Eastern women an escape from the pressures of meeting the standards of rail-thin super-models. 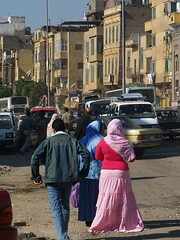 Certainly, it offers a respite from leering eyes of strangers, but judging from the billboards and advertisements around the city, Egyptian men and women are exposed to their fair share of gorgeous models in very little clothing yielding the same, nearly impossible, goals of beauty for women (and men) to live up to. It’s not an easy question to answer. Of course, many women will prefer the hijab and even those that don’t, will find it easy to wear in a culture that grows up this way. Men remark that women look more beautiful in a burqa, even though they can’t actually see them at all, because their modesty is so appealing. Are the women, who feel more comfortable behind the veil, saying so because of the pressure of society to remain covered, or because they really prefer the anonymity? Are they claiming that the veil offers women a freedom that women in the West can’t easily enjoy or are they merely suffering from a victim mentality: knowing there is no escape they begin to enjoy the prison? One thing is sure, this book is not so easy to judge by its cover. The most interesting thing about reading vintage science fiction is how apparent the things people took for granted are. H. Beam Piper is one of the giants of early science fiction and his stories are elegant and fascinating. While reading The Worlds of H. Beam Piper, a collection of short stories, I particularly enjoyed his frequently recurring self-made, personally responsible, characters. In Piper’s future, heroes will be libertarian! Piper is also interested in the effects of time travel and many of his stories offer an alternative view to the results of going back and forward in time. In the most interesting, the hero and villain are actually one and the same, cleverly woven together through a fascinating fold in time. Even then, the now permanent time loop keeps repeating and we never learn the true ending to the tale. What remains interesting though, is that, in spite of Piper’s tremendous attention to detail and huge leaps of imagination, he still sees a future where gentlemen smoke a pipe and information is presented from tape on visiscreens (TVs). Weapons change and medicine improves, but the world is still divided into the Soviet bloc and the free western world. Piper is not so pedantic that he assumes the same bad guys in the future, but the fact is, his future isn’t much different than his present, but rather a plausible extension. The challenge, however, for science fiction writers, is to imagine a world that is plausible enough, alright, but one in which the things really does grow and change, perhaps in unexpected ways. It’s not easy to imagine the internet or what happens after the Singularity, but no one forced them to take the job. Still, Piper’s writing about an imagined future tells us more about his present than he may have intended. After all, that’s whom he was writing for in the first place. Gebel Musa: Mt. Sinai, looms before you. 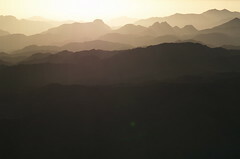 It’s the wee hours of the morning and the first light of dawn is proceeding the sunrise on distant ridges behind you. You’ve been hiking for about an hour now, climbing steadily passed Bedouin camel riders offering to carry you to the top of the holy mountain, calling: “Camel? I give you good price!” The only other sounds are the crunching of your feet on the loose stone path, the tinkle of bells on the saddles of the camels, and your own breath. Up ahead in the purple light and hanging from the towering peak, now only well under an hour away, a flickering fire signals some activity. Most likely it’s a kiosk selling tea and coffee and maybe, if the peak is as near as you’re beginning to think it is, blankets in case it gets too cold. Gebel Musa is a holy place. Archaeologists may dispute it, but Judaism, Christianity and Islam all recognize this as the place where God gave the prophet Moses the Ten Commandments. Here, in the southern Sinai peninsula, after crossing the Red Sea and still wandering in search of the promised land, Moses’ band of former slaves to the pharaohs, camped during their trek across Egypt. Here, Aaron waited with the rest of the Jews for his brother to return from his ultimate vision quest. Still today, there are many pilgrims who come to this place to see and feel the power of history for themselves. Several of them seemed to have gathered at the kiosk up ahead; you can hear the hushed voices of people discussing the climb and drinking tea before they make the final ascent. Suddenly, crashing through the nearly mystical peacefulness of misty silence and dawning purple and steady climbing, comes a scraping seething sound. Xchxchxchxchxhxchxchxch. It takes a moment to recognize this sound because it’s so loud and unfamiliar. Xchxchxchxchxhxchxchxch. Then you do recognize it as it echoes across the ridges and rocks around you. It’s the sound of pressing the back of your tongue against your soft palette as you scrape air through the gurgling gap. Xchxchxchxchxhxchxchxch. It’s the sound of hacking up phlegm. Really. Stop reading and make the sound. Loud. Really retch up a gob of phlegm from deep down. After you’ve rid yourself of the results in the appropriate receptacle, come back and read on. You remember the sound now? Xchxchxchxchxhxchxchxch. High upon this holy mountain, in the otherwise dead silence, someone is retching and scraping louder than you’ve ever heard anyone do so ever before. And the sound keeps coming. You reach the people and you try to make out with your headlamp just which person is doing this. It’s so loud! You’re not sure if this person is really going to be OK! Xchxchxchxchxhxchxchxch. People have come from all over the world, some seeking a deep religious experience on the top of this dry mountain in Egypt and someone thinks it’s really quite OK to hack like they’ve swallowed an unwound spool of thread. Xchxchxchxchxhxchxchxchxhxchxchxch. Egypt is a place where people frequently blow their nose into the street by plugging one nostril and exhaling forcefully out the other. Who needs tissue? Bedouins still live in their traditional desert homes and they don’t come in contact with very many people. Xchxchxchxchxhxchxchxch. So it’s even more surprising when this unholy noise is not coming from one of the locals. Instead, a Bedouin man is just as shocked as you are at the tiny Korean woman who is retching over and over again near his stand. He trying to tell her to stop but she doesn’t seem to understand. He’s yelling at her and shooing her away but she just angrily waves him off. She just keeps doing it, now a few feet from your ears and it is just amazing how loud this is. Did you really try it yourself a moment ago? Maybe you should try again now, only really with some gusto this time. I doubt you’re even close. The little woman was incredible! Off you go to finish the hike. Surrounded by the beauty of the rocky landscape, the sunrise, and the swirling power of history, and now, the faint echoes of someone hacking up a phlegm-ball. Really adds to it, doesn’t it? I wonder if that was a sign. Alright, it is possible to blog on the road, but it didn’t turn out to be convenient or cheap. Internet cafés in Egypt were as little is 5£E (about $1) but as much as 20£E, and that’s when one could actually figure out the price. These tiny little rooms with a few aging computers and smoking locals weren’t always the most comfortable, but they’d get the job done. More importantly though, after seeing sights and fighting off the touts, we were too tired to actually sit in front of a computer and write. Plenty of stories to tell, though. First I’ll have to look at the pictures myself.